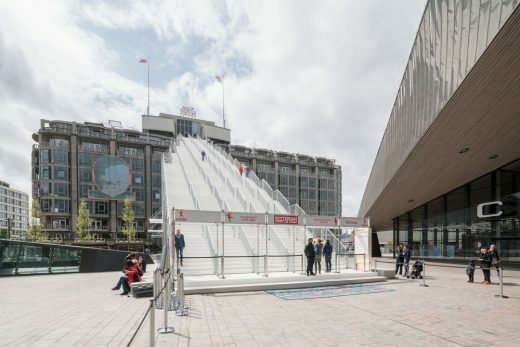 Yesterday the Mayor of Rotterdam, Ahmed Aboutaleb, opened The Stairs to commemorate 75 years of the reconstruction of Rotterdam. 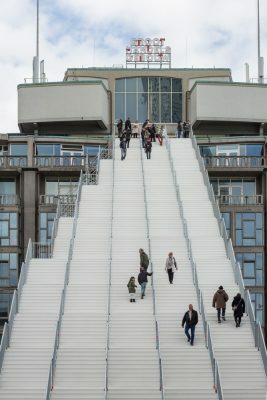 180 steps leading up from the Stationsplein, outside Rotterdam Central Station, have begun taking visitors up to the rooftop of the Groot Handelsgebouw, an iconic building in the history of the post-war reconstruction of the city. 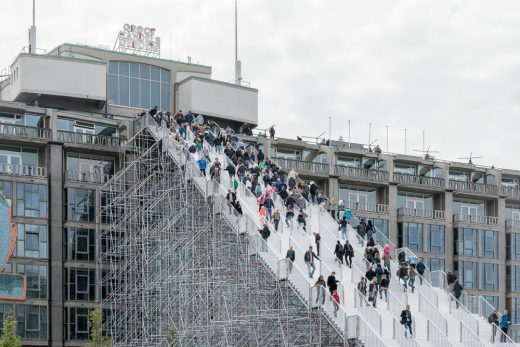 In its first day, The Stairs had 7850 visitors. A month of activities will follow, including film screenings, debates and art events. The Stairs will remain open until the 12th June and is open with free admission to visitors from 10:00 to 22:00. 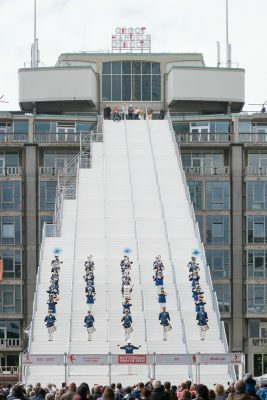 Rotterdam’s Mayor led the celebrations yesterday, opening The Stairs to the public. 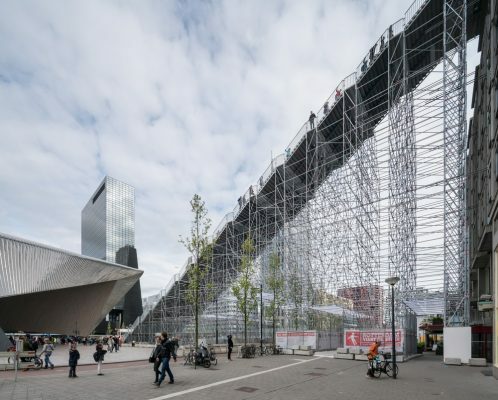 The scaffolding structure, assembled by Dutch Steigers, will take visitors 29 metres up to the roof top of the Groot Handelsgebouw until the 12th June. A viewing platform offers stunning views of the city’s skyline whilst the iconic Kriterion Cinema, once popular in the 1960s, will reopen for this month only to host a variety of films, debates and performances. 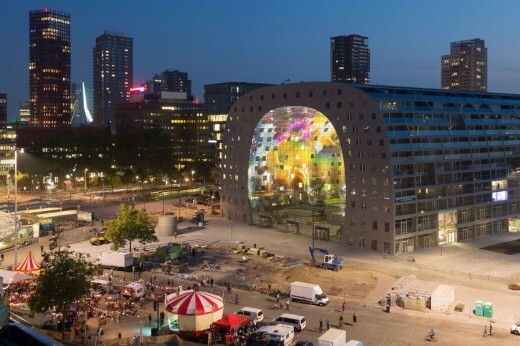 Highlights of the month’s activities, organised in partnership with Rotterdam Celebrates the City!, include a lecture and debate by MVRDV co-founder Winy Maas on the 30th May in which he will discuss the future of Rotterdam and its architecture. The Lucht Café is offering refreshments to tired climbers and relaxed observers alike. 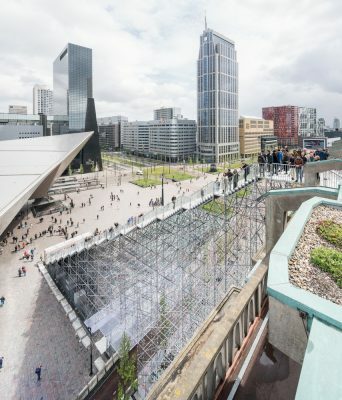 And an exhibition reimagining the next layer of Rotterdam’s development takes existing buildings around the city and activates their rooftops, creating new public spaces and connections between them. “With this installation and in our exhibition we show what this city could look like if we do that in many places, engaging a series of our existing buildings and giving access to their roofs, to create a new, much more interactive, three dimensional and denser urban topography for the next city generation,” Winy Maas explains. 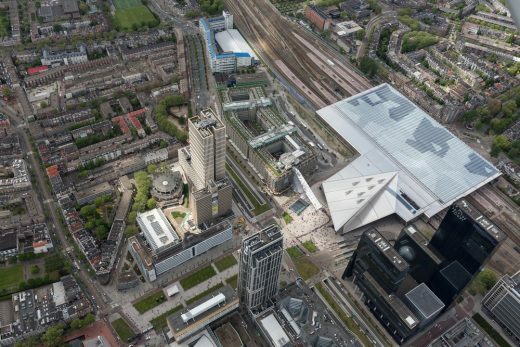 The installation and exhibitions are open to the public between 10:00 and 22:00 and offer an impressive temporary landmark for Rotterdam. 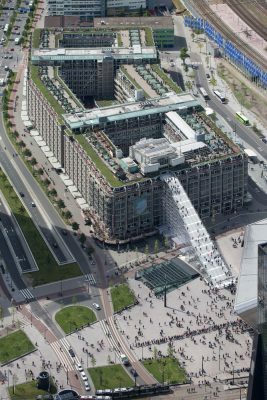 The scaffolding responds to the angles of the Rotterdam Central Station, connecting the contemporary icon with a historic monument, whilst through its construction referencing the reconstruction that the city has experienced. For the construction of the project MVRDV worked closely with Dutch Steigers and Adviesbureau Dekker Engineering. Coordination of events for the installation itself was done in partnership with Rotterdam Celebrates the City!